The sacrifice of Christ is something worthy to be praised, and you can do so in style with this gold cross pendant from Apples of Gold. The cross is crafted from premium quality 14K yellow gold for that classic golden glow. The silhouette design is open for a remarkable take on the traditional cross. Each end of the cross is given a crown-like design and slightly flared. 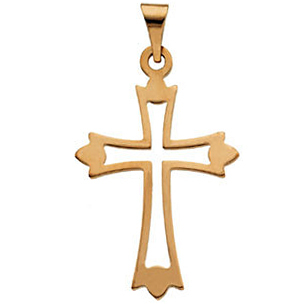 This fashionable gold cross pendant will be a beautiful reminder of the Savior's sacrifice. We guarantee our Fleurie Cross Pendant, 14K Yellow Gold to be high quality, authentic jewelry, as described above.